Who’s the Real Jackie Bradley Jr.? For as valuable as he’s been with his legs, Bradley has attempted curiously few stolen bases. Heading into the 2017 campaign, a lot was expected of Jackie Bradley Jr. In 2016, he’d shown that his late-season breakout the previous year was no fluke. He recorded five wins, bashed a career-best 26 homers, and earned a place on the All-Star team for the first time. He was excellent on the defensive side of the ball, as well. There was sufficient reason to think he’d reach a new level. Unfortunately, though, this season didn’t quite go as planned. If his career seemed to be trending up, the 2017 campaign changed that impression. It was an unexpected chapter in what has become a pretty strange career up to this point. Let’s start with Bradley’s power output. In 2015, when then-interim manager Torey Lovullo finally gave Bradley a shot at regular playing time, he started pounding the ball with authority. For the 2015 season as a whole, he posted a .249 ISO. From his July 29 call-up to the end of the season, his ISO was .272. No one expected him to carry that over for a full season in 2016 — only 24 players have ever posted a .270 ISO for a whole season while manning center field, and the list of players who have done it more than one season is perilously short, including only Carlos Beltran, Joe DiMaggio, Jim Edmonds, Ken Griffey Jr., Mickey Mantle, Willie Mays, Duke Snider, Gorman Thomas, Mike Trout, and Hack Wilson. Ten guys. Nevertheless, the last two seasons have been marked by a dramatic decline in Bradley’s power output. He posted a respectable but not eye-catching .219 ISO in 2016 and then dropped to .158 this season. His GB/FB ratio has risen the past two seasons, and his 49% GB% in 2017 was his full-season career high. Normally, this would have been a bit mystifying. Certainly Bradley still has power. We can see that in his Statcast numbers. This is a mixed bag. In 2017, Bradley hit the ball hard with the same frequency as in previous seasons — and when he did hit it, he hit it with the same authority. In other situations, though, Bradley’s contact was poorer. There was a wider gap between the well-hit and poorly hit balls, a development you can see in the lower average exit velocity and batted-ball distance. So, the ability is still there, he just didn’t get to it as consistently last season. The oddities don’t end there. Bradley had succeeded in 2015 and 2016 in part because of his ability to hit fastballs, but fastballs gave him a much harder time in 2017. And while his strikeout percentage didn’t drop, his contact percentage dropped by nearly four percentage points. Bradley is also oddly non-aggressive as a base-stealer. It’s not because he’s a bad baserunner. Over the past two seasons, he has the 14th-best baserunning runs in the majors. He posted a +5 BSR in each season. That’s pretty good. But in 2016, he stole nine bases in 11 tries. This past season, he stole eight bases in 11 tries. For a player who’s been so successful on the bases in other ways and who’s been efficient on the stolen bases he has attempted, it seems strange that he wouldn’t add that to his tool belt. I had a sense that this might be unusual, so I did a little bit of digging. There are 30,189 player seasons where the player in question had at least 200 plate appearances in a season. Of them, 847, or 2.8%, were seasons with a 5+ BsR. Of those 847, only 23 of them were seasons in which the player in question also snagged fewer than 10 stolen bases. I highlighted the two players who appear on this list twice, Rasmus and Bradley. In neither of those two seasons did Rasmus ever really try to steal bases: he had seven attempts combined compared to Bradley’s 22. Bradley, on the other hand, tried to steal bases with some frequency, just not as much as other talented baserunners have in the past. This is particularly mystifying to me, because Bradley typically bats lower in the order. Put these two things together — that Bradley still has the talent to hit the ball hard, but didn’t do it as often, and that he is a very good baserunner who has tried to swipe bases less frequently than most players with his demonstrated performance have — and it seems to me that you have a player with untapped potential. This is an important consideration when thinking about the 2018 Boston Red Sox. As Dave mentioned yesterday, the Sox may try to add a power bat, or they may even try to deal Bradley if they find the right trading partner. But, realistically, if they are hoping to improve significantly on last year’s meager offensive output, it’ll be the players they already employ who’ll need to step up. Let’s take a look. The only player on this past season’s Red Sox club who experienced a bigger drop in wRC+ from 2016 to 2017 was Hanley Ramirez, who couldn’t maintain the pace from his 2016 dead-cat bounce. Bradley didn’t have the largest drop in terms of his projected 2017 output to actual 2017 output, but overall he performed the worst of the six hitters in question. He’s also pegged for the lowest projected wRC+ in 2018 aside from Vazquez, and Vazquez doesn’t completely count since he won’t play every day. Obviously, not every regular contributor is considered here. For example, I omitted Rafael Devers since he didn’t play in 2016. And it doesn’t account for whatever changes the team makes this offseason, since we don’t what those are yet. But it reveals how much of the Red Sox’ success in 2018 will depend on the contributions of their established regulars. And much of that falls on Bradley’s shoulders. Like I said, Vazquez won’t play every day. Ramirez, at 34, is on the downswing; given his offseason surgery, he shouldn’t be counted on for a huge improvement. Pedroia is going to miss at least two months of the season. That leaves the Killer Bs — Benintendi, Betts, Bogaerts and Bradley. Of the four, I feel like Bradley is the least predictable of the bunch. He’s had such wild swings in performance — he posted a 51 wRC+ in the second half, for instance — that it can be hard to separate out who is the real Bradley and who isn’t. The important thing is that his underlying skills don’t look to have changed, he just has to harness them for a full six months. If he does, there’s no reason he can’t be that 5 WAR player he was in 2016. But given the oddities in his past performance, banking on that no longer seems wise. We hoped you liked reading Who’s the Real Jackie Bradley Jr.? by Paul Swydan! What Should the Pirates Do with Andrew McCutchen? 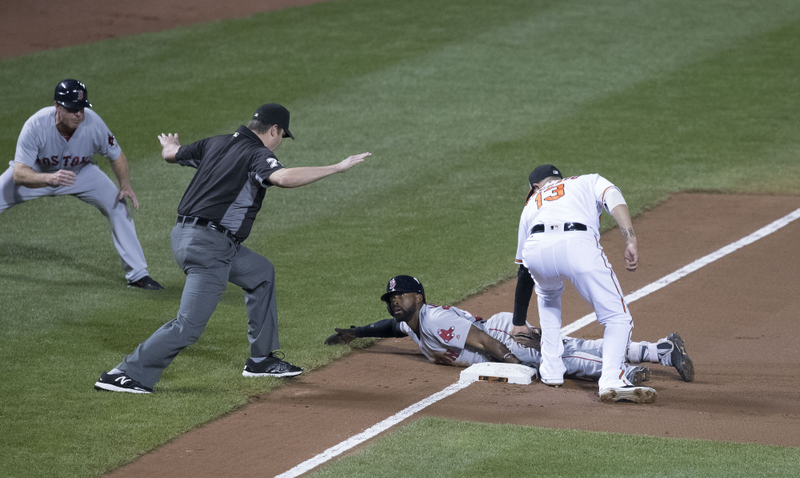 Great article, however that sublime defense in Fenway vast and difficult CF would be difficult to find anywhere,and the average output would be considered acceptable. Inexplicably, they already have an elite defender with Fenway experience to his left. Betts has exhibited the chops to play CF and could easily fill that happened should Bradley be moved. Id counter that we havent seen enough of Mookie in center, coupled with Mookie being the best RF in baseball(its not close). Would the Sox really want to have him learn ANOTHER position? I happen to believe JBJ plays a better CF than Mookie. While I agree with your statement to an extent, why move the GG, fielding bible winner, best overall defender,most DRS, most DRS over two years in RF. Probably the best to ever play Fenway RF (ill get hate for that comment) to CF just to get rid of an elite glove average/above average bat and likely replace Mookie with a below average defender who can hit homeruns and cost 25 mil? I think first/DH is the position to focus on moving, and GOD Bless Mitch for overachieving and saving errors for our infield. If Bradley is moved for a big bat then Benintendi moves to CF as he is a CFer by trade and a bad fit for LF at Fenway. The big bat then plays LF. Betts isn’t moving as Fenway requires a CFer with a good arm in RF.